Here is a challenge. 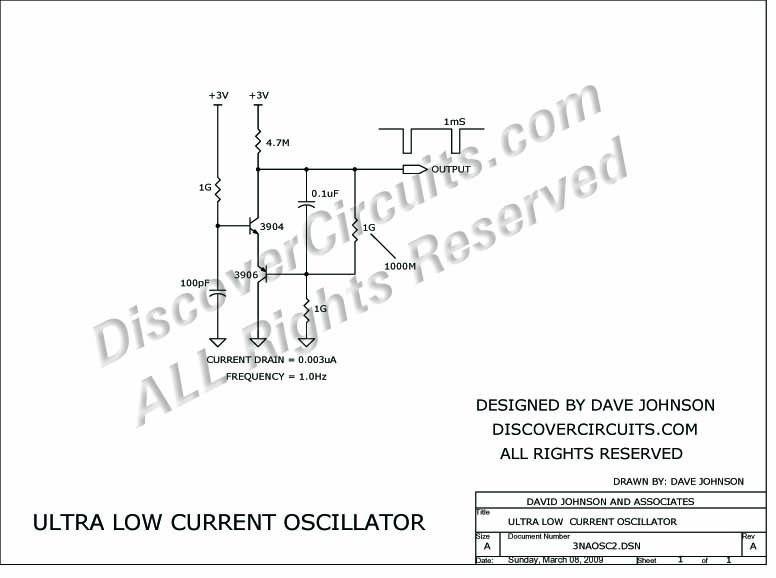 Design an astable oscillator which draws only a few nanoamps of current from a +3v supply. I gave this some thought and came up with the circuit below. I used some pretty standard parts except for three surface mounted 1000M resistors I had on hand. The oscillator frequency measured a low 1Hz frequency and the average current was a very low 3 nanoamps. If I had some higher resistors values handy, I think I could have gotten the current down below one nanoamp. The circuit functions like a unijunction transistor relaxation oscillator. The base of the lower PNP transistor is biased at roughly half supply. As the 100pF capacitor is charged up through the 1G resistor, the base of the upper NPN transistor reaches a critical voltage, which begins to forward bias the base-emitter junction of that upper NPN device and the lower PNP device. The base current causes the collector current to quickly rise. As current starts to flow in the collector of the upper NPN part, the collector voltage drops. The 0.1uF cap AC couples this negative going signal to the base of the lower PNP part. This connection turns that lower part on harder, causing an avalanche current pulse. The result is the discharge of the 100pF cap. The two transistor circuit then resets and another cycle is started. How do you measure 3 nanoamps of current? I’ll show a way later, using some pretty standard parts.